Our vehicles leak an estimated 3 million barrels of oil every year in North America. This oil harms the environment, our pavement and creates hazardous driving conditions. We have the ability to capture this oil before it leaves the vehicle and once captured it can be recycled. The Oil Tray can best be described as a Smart Washer that goes on the vehicle’s oil drain plug. Oil that seeps from the seals and gaskets of the engine will generally gravitate to the lowest part of the engine prior to leaving the vehicle. The absorbent pad of the Oil Catcher will retain this oil. Pads can be replaced when required at the next scheduled oil change. 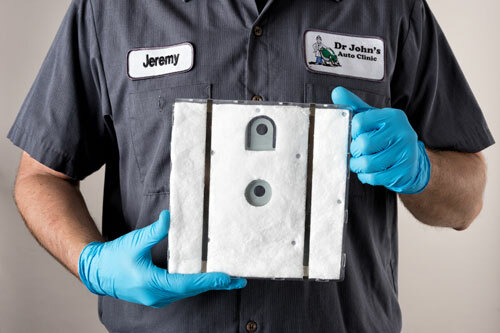 The soiled pad can then join the used oil and filter in the recycling process. 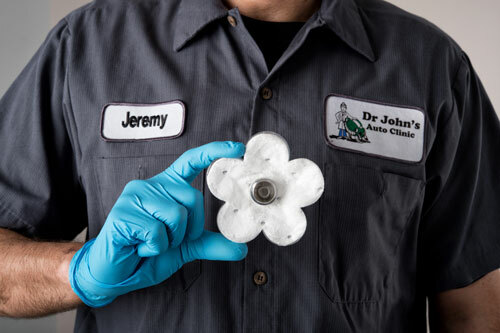 The Oil Flower is attached with a combination of magnetic force and gasket adhesive. It can be placed anywhere on the oil or transmission pan to collect any leaking oil or transmission fluid. The absorbent pad can be replaced when soiled and then recycled. The Oil Catcher Tray and the Oil Flower should be used prior to a leak being detected as added protection and also can be used on Class 1 and Class 2 leaks. Class 3 leaks need repair work.